Newark will be transported 370 years back in time on 30th April and 1st May to re-fight the battles which shaped the future of England. 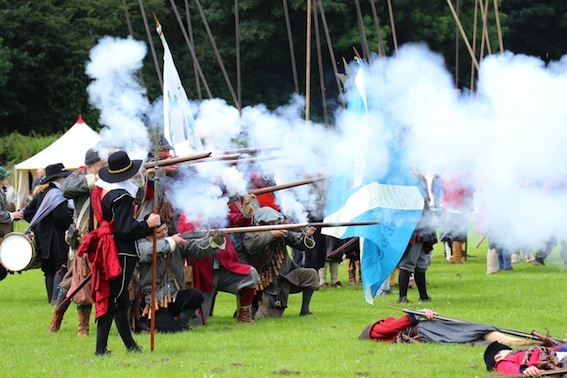 Over 300 re-enactors will descend on the historic Nottinghamshire town during the Bank Holiday weekend for the spectacular 3rd Pikes and Plunder annual civil war festival. In 1646 the Royalist outpost was cut off by 16,000 Parliamentarian and Scots troops and its fall on 8th May marked the end of the first civil war that saw the British Isles plunged into violent turmoil. Now the heroism, colour and tragedy of that time will be brought back to life by the National Civil War Centre and the English Civil War Society. Pitched battles with musketeers, pikemen and cannons will break out at the magnificent star-shaped Queen's Sconce – the finest surviving civil war fort of its kind anywhere in Britain. There'll also be a big living history encampment in the grounds of Newark Castle to reveal how armies were clothed and fed and the National Civil War Centre will host re-enactors and churn out seventeenth century style propaganda sheets using a replica printing press. "It will be a spectacular couple of days for visitors with the town garrisoned by hundreds of costume clad re-enactors. This will be a much bigger event than last year and the settings could not be more authentic. We have ordered the gunpowder, cleaned the muskets and unpacked the pikes – so it's time decide the fate the nation once again." Battles at the Queen's Sconce start at 2pm both days, whilst living history at the castle is portrayed in vivid style between 11am and 4pm. The National Civil War Centre opens 10am to 5pm and there'll will also be drills in the fabulous cobbled Market Place at 11.20am both days. "We have worked hard to create a colourful and exciting event drawing 17 regiments from all across the UK. The Sconce, castle and parts of the National Civil War Centre building all witnessed and survived the deadliest conflict in our history. That makes Newark a very special place for re-enactors, offering a chance to fight, drill and camp in one of the nation's best civil war landscapes." The civil war began in Nottingham when the King raised his standard to rally forces in his dispute over tax, power and religion with Parliament. Four years later the ill-fated monarch returned to Nottinghamshire to surrender to the Scots army outside Newark. In 1649 he was put on trial and beheaded, eventually succeeded by Oliver Cromwell as Lord Protector. So which side will you support at Pikes and Plunder - King or Parliament? 1. The British Civil Wars claimed more lives that World Wars One and Two combined. 2. There are more civil war re-enactment groups in England than for any other historic time period. 3. Although Newark supported the King, Nottingham became a stronghold of Parliament. 4. A skilled musketeer could fire three shots per minute, but because it was a dirty job they were at the bottom of the social pecking order, below a pikeman. 5. The biggest cannons could fire a 32 pound ball over 1.5 miles and were so big they were given names. The one used in the sieges of Newark was called Big Lips, named after a Hull prostitute. It took up to 60 men and a team of ten horses to haul it across land, so a barge was often used.